TopNotes - Organize your projects, notes and life now! TopNotes helps to manage any kind of information like addresses, phone numbers, recipes, pictures, videos and so on. Stores information in rich-text notes, arranged in a tree structure easy to organize. Organize notes in a tree structure and stored in project files (notebooks). Each notebook file can include an unlimited number of notes. Each note can include text, pictures, videos, sounds or OLE objects. Compress notes project files using ZIP deflate algorithm. Unique features as Bookmarks and History of the last notes modified. 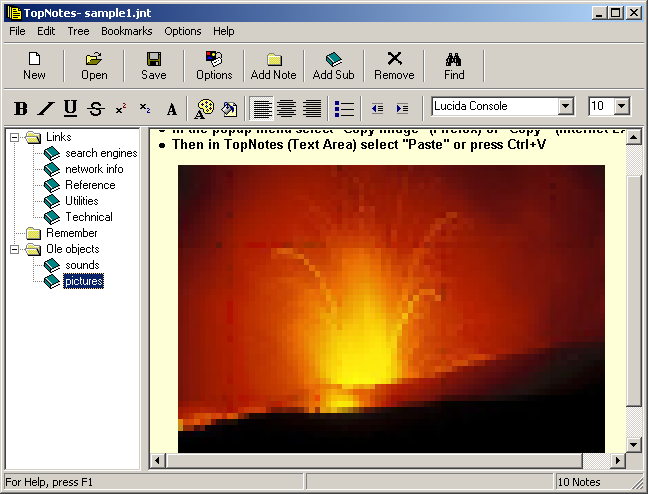 TopNotes is an stand-alone program. Does not require additional DLL, VBX, OCX, or external databases. Can use project notes stored in a LAN. Recognize web and email addresses and when doubleclicked launch default browser or email client. Can be set in the tray always available at hotkey. A must have program always present when you need it.